Bladensburg Peace Cross, located at west entrance to city on MD 450. In Bladensburg, Maryland, there is a memorial to the 49 men from the area who died in WWI. It was erected in 1925 by the American Legion. The memorial is known as the Peace Cross and is forty-feet in height. The American Humanist Association is a group representing people who believe in “being good without a god.” They regard the memorial as unconstitutional because it is a religious symbol giving the impression that it is only honoring servicemen who were Christians. In 2014, they filed a lawsuit which demanded that the memorial is destroyed, changed or taken away. On Wednesday that suit received a ruling from the Fourth Circuit Court of Appeals that agreed with their stance. The court ordered the memorial must be taken down because it is shaped like a cross. 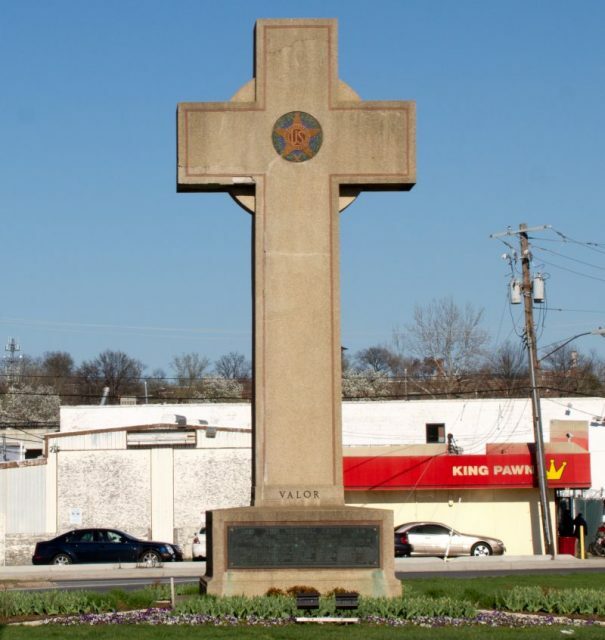 According to the ruling, the cross is the “core symbol of Christianity,” and therefore a government-sanctioned memorial in that shape is a breach of the separation of church and state. The court in its 2-1 ruling stated that an observer would conclude from the memorial that the government endorsed Christianity. The ruling reverses a prior decision in 2015 that determined the purpose of the cross was not primarily religious and that the site had mainly been used to celebrate federal holidays, not religious holidays. The memorial was placed at the intersection of Route 450 and Alternate US 1. It stands on a rectangular base that has the words Valor, Endurance, Courage, and Devotion inscribed on it. According to Roy Speckhardt, the executive director of the American Humanists Association, a government war memorial should be respectful to all veterans, not just those from a particular religious group. Chief Judge Gregory dissented. In a separate document, he wrote that the memorial was dedicated to the character of the deceased soldiers who bravely fought for their country and the liberty of others during the war. He believes that a monument dedicated as such cannot violate the Constitution that those men defended. The site is owned and maintained by the Maryland-National Capital Park and Planning Commission. They have spent $117,000 maintaining and repairing the monument. The commission was created by the Maryland General Assembly in 1927 to serve the Montgomery and Prince George’s county areas. The commission has the option of appealing to the Supreme Court. First Liberty Institute lawyer Hiram Sasser said that the ruling was a “dangerous precedent” because it ignores history and could lead to the destruction and/or removal of memorials across the nation. First Liberty Institute and the Jones Day law firm are representing the American Legion in the legal battle. Michael Carvin is a lawyer for Jones Day. He said that removing the memorial would be a dishonor to those who died in WWI. He added that the memorial has stood for nearly 100 years and is protected by the First Amendment. The First Liberty Institute is a group from Texas whose mission is “to defend and restore religious liberty across America.” They look to protect religious expression in all areas of US life. Who’s in control of that?